Harmonics come in various forms, and in this electric guitar lesson, we will look at different ways to incorporate them into chords. We will utilise natural harmonics, a mix of fretted notes and natural harmonics as well as tapped and artificial harmonics. Our first example uses natural harmonics to outline an E minor chord progression. 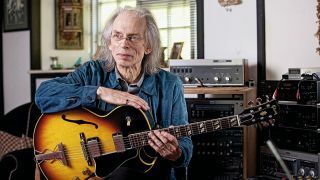 Prog fans will recognise this as a Steve Howe [pictured] trademark, made famous in his work with Yes. The open strings automatically provide us with an E minor chord, so the natural harmonics tend to work well within that key. Place your finger directly over the fretwire and touch the string gently, without pushing down on to the fret. Now strum while simultaneously lifting off your fretting finger and you should hear a nice chiming sound. This works best at the 12th, 7th and 5th frets. Artificial harmonics are usually associated with single notes, but can also be applied to your chord playing. To create the artificial harmonic we touch the string 12 frets higher than the fretted note. For example, hold the 5th fret with your first fretting finger and position your first picking-hand finger directly over the 17th fret. Your fingertip must be directly in line with the fretwire as this is where the harmonic resides. Next pluck the string with your thumb and immediately lift your first finger off to produce the harmonic. Applying this to a chord is trickier as it requires the thumb and first finger to touch and pluck each string in a single smooth motion. With practice you can use this technique to play beautiful, chiming chords. Example 3 demonstrates adding tapped harmonics to chords. This will work with both open chords and completely fretted chords. Strum any chord and let it ring. As it sustains use your picking hand’s second finger to quickly hammer the string against the fret. A good place to start is 12 frets higher than the fretted note in question; this will give you the most easily accessible harmonic. When you have developed more control, look for other harmonics along different points of the string. Example 4 shows how artificial harmonics and fretted notes can be combined to create arpeggiated chords like Tommy Emmanuel. This technique alternates between fretted note and harmonic to create a sequence of ringing close intervals not otherwise possible. Natural harmonics can also be used to create ringing close intervals. Ex 5 is partly inspired by Alex Lifeson’s repeating harmonic motif playing in Rush. Here we have added some bass notes to give the harmonics some context within a chord progression. These are just a few of the creative ways in which harmonics can be used to embellish chords. Experiment with all these ideas and see what you can come up with. Let the low open E note ring and play the harmonics at the 12th, 7th and 5th frets. Place your fretting finger across the strings directly over the fretwire to produce the cleanest harmonic possible. A millimetre above or below the fret on the neck will make the harmonic sound dull, so aim to be accurate! Fret the chords by barring at the 5th, 7th and 9th frets with your first finger. Use your picking-hand first finger to lightly brush across the strings 12 frets higher at the 17th, 19th and 21st frets. As your first finger makes contact with the strings, simultaneously pluck them with your thumb to create the artificial harmonics. Strum the first chord and let it sustain, while reaching over to the 12th fret with your picking hand. Quickly hammer the string against the fretwire at the fret indicated above the tab and you should hear a harmonic. The TH stands for Tapped Harmonic. Barre the 5th fret with your first finger. Pluck the notes fingerstlye and for every second note use the first finger and thumb of your picking hand to produce artificial harmonics at the 17th fret. Alternate between fretted and harmonic notes and allow them to ring together throughout. Use your first and fourth fingers to play the natural harmonics at the 7th and 12th frets. Repeat this descending motif and add the bass notes using your second finger and the open strings. Allow the notes to ring together as much as possible.